A, B, C, Recording traces of hNav1.7 current in the presence of Smartox sProTx-I (100 and 300 nM). The current was elicited by a 50 ms-depolarizing pulse to -10 mV from a holding potential of -90 mV. Inter-sweep period was 10 s. Current amplitudes were plotted against time. Black bar indicates toxin application. D, Families of hNav1.7 current traces in control and in the presence of 100 nM ProTx-I. 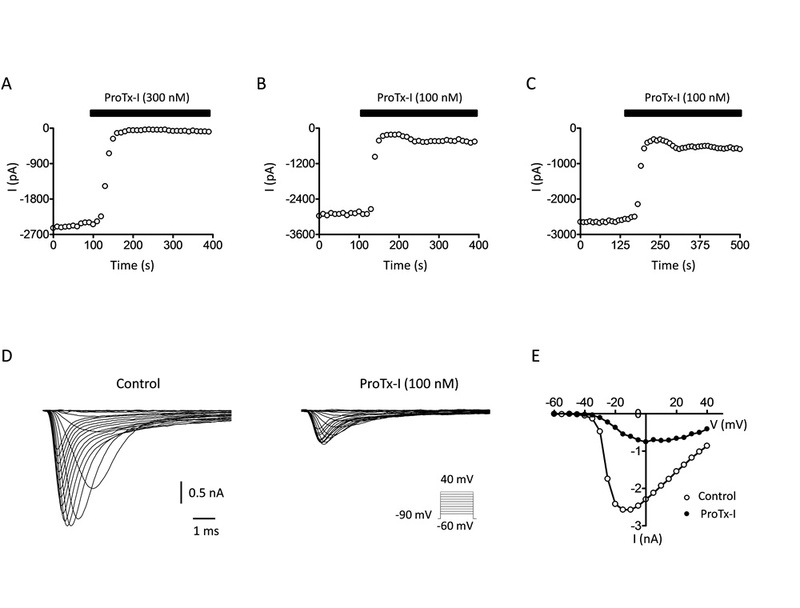 Currents were evoked by depolarizing pulses from -60 mV to 40 mV, while the cell was hold at -90 mV. E, Amplitude-voltage relationships obtained from D.